Twenty years ago, gene therapy was a great hope for the future of medicine - directly tinkering with faulty genes to cure diseases, but progress has been slow. Now, things seem to be changing. Plus, silencing crickets, evolving brain and brawn, and a flowery gene of the month. At UCL, Professor James Bainbridge is developing gene therapy approaches for treating sight loss. I asked him about the latest progress. Kat:: Over recent decades, the scientific world has become increasingly excited about the potential for gene therapy - manipulating or replacing faulty genes to treat or even cure human diseases. But so far there's been a lot of hype, but very little actual progress in clinical trials. Now things seem to be making some headway, particularly with gene therapy for certain forms of sight loss. To find out more I spoke to Professor James Bainbridge, from UCL's Institute of Ophthalmology, who's testing treatments that deliver genes directly to the retina - the area at the back of the eye responsible for vision. I started by asking him to explain exactly what we mean when we talk about gene therapy. James:: So gene therapy refers to treating someone's condition at a genetic level. Perhaps the simplest form, it involves using a gene to treat a condition. That gene is typically one that the patient, the person with the condition, otherwise lacks. So, some people develop conditions because they fail to inherit a critical gene from either of their parents and the simplest of gene therapy involved providing them with a copy that they would otherwise have inherited from their parents. Kat:: In the case of the area that you're interested - the eyes - what kind of conditions are we talking about where you think gene therapy could be a promising avenue? Are we talking about very common or quite rare diseases? What kinds of diseases are they? Can you give me some examples? James:: These diseases which are inherited are cumulatively quite uncommon. In fact, they are a significant cause of sight loss in the UK. They comprise a large number of distinct conditions, all associated with specific defects in different genes and so, one of the challenges that we face is being able to develop treatments that are going to address each and every one. Kat:: So individually, they could be quite rare, but together, a large number of people are affected. Kat:: So, how do you actually do gene therapy on someone's eyes, on their eyesight? James:: So, the aim is to provide the cells in the retina with the genes that they otherwise lack. To do that, we can use microsurgery to inject the genes into the retina. To improve the efficiency of that, we can package the genes within a modified virus or a vector. Using some of the modern vectors that have been developed, we can do so very efficiently. And in some of the models, we are confident that the genes are seen to be preserved in the eye for many, many years. Kat:: So basically, you're injecting viruses carrying replacement genes into the back of someone's eyeball. Is it working? James: We're very excited to see actually that it does appear to work. In some very carefully selected conditions, using some very carefully developed bespoke techniques, we're very confident that this particular technique can offer benefit in terms of improving aspects of sight in people who otherwise lack it. The challenge now, were going to be to address a number of different conditions and try to expand the potential application of this to a larger number of people. Kat:: It is quite easy to see how this could be a really great approach for conditions that are caused by a single gene fault. What about more complex conditions of sight loss that might involve multiple gene faults or just slow degradation of your vision over time? James:: So certainly, it's going to be much less straightforward to target multifactorial or multi-genetic conditions. 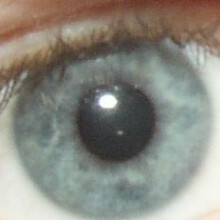 Although there are some distinct advantages to using this kind of technology for such conditions in the eye because gene therapy technology which involves delivering a gene into the eye in a stable way is one way of establishing delivery of a therapeutic protein of a medicine to the eye locally in a targeted and sustained way so that people will potentially expect to benefit over a long period of time. There are a number of applications at the moment for repeated injections of medicines into the eye and this potentially offers one alternative to that. Kat:: In terms of where we are with this kind of approach, how close are we to seeing this in the clinic or in a more widespread level or is it still really at an experimental stage? James:: At the moment, this is very much at the experimental stage. We are addressing a number of different conditions in the clinic. A number of different patients and people with inherited sight disorders particularly, but also those with more common conditions such as age related macular generation are participating in clinical trials of this very novel technology. We're very excited by the first results that suggest that it can be safe and that people can benefit, but it's too early to say at the moment how much we can expect to benefit and for how long in the longer term. Kat:: In terms of the trials that have been done, have there been some examples where you've just gone, wow! For example, someone really has seen a massive benefit? James:: Absolutely - we're very excited. In our own trial of gene therapy for a form of childhood blindness that a number of individual's natural number of children have actually been able to benefit by improved night vision and it's fantastic to see that response. Kat:: It must be really lovely when you think, "Actually, I've changed this kid's life." James:: We have a number of examples. One specifically is a boy who is 8 years old, who typically and before his involvement in the trial, struggled to socialise during the winter months because of his night blindness. And so, he would prefer not to go outside and not to socialise or play football at dusk or in the dark. It's been very exciting to see how his social life have been transformed if you like by the ability to play football outside in the evening. And that sort of thing is really very rewarding. It's certainly very exciting. It's just too early to know how soon this might be applicable to other people who have similar disorders. We're very optimistic for the future. Kat:: That was Professor James Bainbridge from UCL. Professor Jane Davies, at Imperial College London, is involved in a major UK trial of gene therapy for cystic fibrosis. Kat:: Another area where gene therapy could potentially bring big benefits is cystic fibrosis, or CF - a disease caused by a faulty gene called CFTR, which affects around one in every 2,500 babies born in the UK. Professor Jane Davies, at Imperial College London, is involved in a major UK trial of gene therapy for cystic fibrosis. She explained how the disease is caused, and how gene therapy might be able to help. 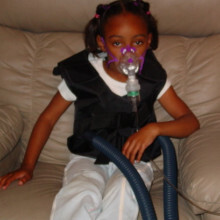 Jane:: Cystic fibrosis is what we call recessive condition which means that if patients have just one copy of an abnormal gene, they can be completely healthy and are carriers. But if they inherit two copies, i.e. one copy from each parent of the faulty gene, then they have cystic fibrosis. In normal health, what the cystic fibrosis gene does is it generates a protein which is very important in lots of cells in the body for shuttling salts in and out of cells. The reason that that's important is because water tends to follow salt wherever it goes. And so, particularly in organs such as the lungs and the digestive system, the surfaces of those organs are dehydrated and extra sticky and dry. With regard to the lungs, bacteria can get in there, set up infection, and inflammation follows infection and then we get lung damage which ultimately leads to respiratory failure. Kat:: In terms of gene therapy, you think, "Well, that's great! We should just be able to fix that faulty gene." I guess that's the idea. How do you approach doing that in practice? Jane:: So actually, fixing the faulty gene is extremely difficult and what most people with gene therapy are trying to do for cystic fibrosis is ignore the faulty gene but put a copy of the healthy gene into the cells next to it. The faulty gene itself doesn't matter. So, we're sort of taking over the work that the faulty gene should be doing by putting a copy of the healthy gene into the cells. The way in which we try and do that is directly into the airway by breathing in, usually a mist solution - some people have tried to do it with other liquids down bronchoscopes and that sort of thing. We're trying to get normal copies of the gene into the cells by coupling them up with things that we call vectors. The vectors are just little transport systems that carry the gene across the cell surface into the cell and then into the nucleus where it needs to do its work. Kat:: Like little postman really, just delivering the healthy gene into the cells where they need it. Jane:: Exactly like little postman. The two types of postman that people have used are viruses that have been specially modified to not infect the body, but to carry the healthy gene along with their own genes into cells and then synthetic methods such as liposomes which is the route that we are going down. The benefit of the latter is that the body doesn't respond to the liposome in the same way that it responds to a virus. Viruses can be very good the first time you use them, but if you try and use them repeatedly, there's a bit like an immunisation response. So, the body gets used to it and chucks it out before it has time to do its work. So viruses are really good for certain diseases where you just need to do a one-off hit, like certain cancers. But for cystic fibrosis, because it's a lifelong disease, we believe at the moment that the best approach is to use liposomes. We're looking at ways to try and use either longer lasting viruses or viruses that manage to get under the radar of the immune system so that you could give them repeatedly. Kat:: In terms of where you are currently with trying to get these treatments to work, what's the current state of research? Jane:: The current state is that overall globally, there have been well over 20 trials of gene therapy for CF but the vast majority of them have been a single dose often into the nose, sometimes into the lung. But looking for proof of principle: can this little postman get this gene into the cell and make the cell's behaviour a bit more like a healthy one rather than a CF one. The measurements for those sort of behaviours are not clinically relevant. So very, very few trials have actually addressed the clinical relevance of gene therapy. We've just finished that first one that we think has been properly designed to do that where we've taken a large number of patients through repeated dosing over a period of a year. The outcomes that we're looking for are, do these patients get better in a number of ways that we're looking at it. We've finished the trial last week. The data are just being analysed and put onto the database and we'll see whether it's worked which we don't yet know. Kat:: Obviously, for this kind of gene therapies, if you're just delivering things into the lungs, it's only addressing the problems in the lungs. Are there approaches that could maybe address some of the problems elsewhere in the body? Jane:: That's a really good point because it is a multi-system disease. The pancreas doesn't work properly, the gut doesn't work completely normally. Some people have liver disease. So, I think at the moment, because it's lung disease that kills people by and large, most of the gene therapy approach have focused on the lungs. There are some approaches to trying to make the protein itself work better, forgetting about the gene level, coming down to the protein which can be tackled perhaps by an oral drug. That's one of those that's been successful and is on the market now, just for a tiny proportion of patients with CF. That type of approach would have the potential to affect other organs as well. There is at least some suggestion that the gut might be helped by those sorts of oral drugs. Kat:: Obviously, for families with children with cystic fibrosis who are really desperate for something that's going to make a difference, are you positive that this kind of approach is going to payoff in the end? If so, when would you really like to see it making a difference to patients' lives? Jane:: I'm very, very hopeful. We wouldn't be doing it if we weren't hopeful. But I think it would be absolutely misleading to say that I'm positive it's going to pay off. We're going to know the results of this trial in September. We could find out that it hasn't worked at all and then we're back to the drawing board in terms of our next wave of trying to get things to work or we could find out if it's worked marvellously well. If it has then that could potentially be quite a small leap from the end of that trial through phase 3, into clinical benefits. But there's such a big gulf between those two scenarios that I think it would be really foolish of me to say I'm certain or I know when it's going to work. I think that what's very, very encouraging within the last two years, we've had the first proof that you can actually make the protein work and if you can do that, you can make patients substantially better. And that's come from some of these small molecule drugs. So, if we can get enough of the gene therapy into the cells to produce the protein then we know that that should work. But there's quite a lot of ifs along the way there. Kat:: Obviously, with something like gene therapy, there's a lot of science behind it. There's also a lot of clinical time, doctor's time, and patients and their families. How great has the input been here in the UK from the research community and the patient community? Jane:: So it's been absolutely fantastic. I work at Imperial College and we're part of the UK's CF gene therapy consortium, working with colleagues at Oxford University and Edinburgh University and hospitals. The trial that we've just completed has been an enormous effort for ourselves, fantastically supported by our funders, but also the amount of time and help that the patients and their families have put in. Many of them travelling from lots of different cities to our study sites to actually help us with the trial has been absolutely fantastic. We couldn't have achieved this without them. So, we're incredibly grateful. Of course, they and we are very, very hopeful that the outcomes are going to be positive. Kat:: That was Professor Jane Davies from Imperial College. Chirping crickets are an instantly recognisable soundtrack to a hot day - males make the noises by rubbing their wings, in order to attract females. 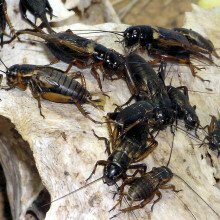 But some crickets living on the tropical paradise of Hawaii have lost their chirp, and researchers at the University of St Andrews think they have figured out why. Writing in the journal Current Biology, the scientists discovered that crickets on two separate islands independently evolved changes in their wings that silenced their chirps, in response to parasitic flies that are attracted to the male song and kill them within a week. The researchers used genetic analysis to prove that the populations on the two islands had evolved the trait separately, finding that they had different genetic changes. Sneakily, these quiet crickets still manage to get a mate by perching next to males that still make noise, but their silence opens a window on the processes of rapid evolution in the wild. Have you ever seen a mouse with a mohawk, or mohican, hairstyle? Scientists at New York University's Langone Medical Centre noticed some mice with unusual mohawk-like hairstyles - the result of over-grooming by their fellow animals - and investigated further, as this kind of repetitive behaviour is a hallmark of the human developmental condition autism. Publishing their results in the journal Nature, the scientists were studying mice that had been genetically engineered to lack a gene encoding a protein called Cntnap4. The protein was previously known to be involved in special brain cells called interneurons, in people with autism. The team discovered that knocking out Cntnap4 affects two special chemical signals in the brain, called GABA and dopamine, which send messages between nerve cells. 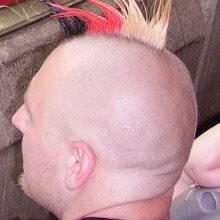 They discovered that the mohawk mice had less GABA, which normally damps down signals in the brain, and too much dopamine, which gives pleasurable sensations. The researchers think their findings might shed light on some of the underlying biological processes in the brain that are at work in people with autism, and potentially point to treatments in the future. 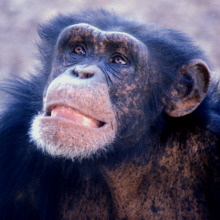 Although our closest relatives are chimps, in evolutionary terms, we're still very different from our ape cousins. And in a paper in the journal PLoS Biology, scientists from Shanghai and Germany have discovered that these differences may have evolved quickly over time in two key tissues - our brain and brawn, or rather, muscle. Humans and chimps split from our last common ancestor around 7 million years ago, and it might be expected that both species have evolved at roughly the same pace since then. But rather than focusing on changes in DNA, the scientists looked at the evolution of metabolites - small molecules like sugars, vitamins and the building blocks of proteins, called amino acids. They found that metabolite levels changed rapidly over the course of human evolution in two tissues: brain and muscle. It turns out that human metabolite levels in the brain have evolved four times faster than that of the chimps, while the change in muscle has been ten times faster. But while this may have improved our brains, it's been at the expense of our brawn - in pulling competitions, the researchers found that humans were easily beaten by chimps and macaque monkeys. It looks like our impressive brainpower may have come at the cost of our muscle-power - perhaps you can only have brains or brawn, but not both. Researchers have deciphered the genome sequence of the blind mole rat - an unusual underground creature that is resistant to cancer. And finally, researchers have deciphered the genome sequence of the blind mole rat - an unusual underground creature that lives for more than 20 years and appears to be resistant to cancer. Writing in the journal Nature Communications, the researchers from an international team encompassing the UK, Israel, China, the US and Denmark believe they have found the genetic signatures revealing the secret of their tumour resistance. 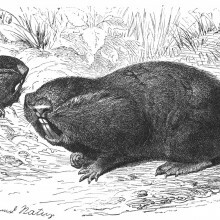 Rather than damaged and faulty cells committing suicide through a process called apoptosis, as they do in most mammals, the blind mole rat's immune system directly attacks cancerous cells and destroys them through a process called necrosis. The researchers found that genes involved in this immune defence have been copied and favoured in the mole rat genome over evolutionary time. It also looks like one of the key players in protecting the body from cancer through apoptosis - a gene called p53, or the so-called "Guardian of the Genome" - is changed in the blind mole rats as part of their adaptation to life in low oxygen. So there seems to be a trade-off between losing the p53 defence, but stepping up an alternative protection mechanism. The researchers plan to continue probing the blind mole rat's genome to find more secrets that could help shed light on many human diseases, including cancer. Kat:: Now it's time to find out more about the latest advances in gene therapy. This month Jacob Giehm Mikkelsen and his team at Aarhus university in Denmark have found a way to use a modified version of the AIDS virus HIV to enter cells and edit out mutations in genes, replacing them with the correct information. The tools in this genetic repair kit are proteins called nucleases, which can be targeted to cut out specific sequences in DNA that are wrong. The a replacement strand of DNA, also carried in the virus, is pasted in to complete the repair. Jacob spoke to Naked Scientist Chris Smith to explain more about his work. Jacob:: We have been looking to find new ways to correct mutations within genes. There are some conventional techniques on the market already and they are based on delivering genes that will encode proteins that will take care of the editing within cells. So, what we're trying to achieve here is a safer way by delivering the proteins themselves instead of delivering the gene for the protein. So, what we have been doing is trying to develop viruses to deliver these foreign proteins into cells. Chris:: Which virus are you trying to do that with? Jacob:: In this case, we're using HIV. This is of course a sort of a controversial topic, but what we are trying to do is to deliver specific proteins by using these viruses that will take care of the correction process in the cells that are treated with the virus. Chris:: So, at the same time it's delivering a genetic message in the conventional way of viruses and gene therapy vector. You're also able to exploit the fact that the virus does carry in some proteins as part of the virus and deliver the proteins at the same time. Jacob:: Yes. First off, what we tried to do was just to figure out whether it's possible to deliver these proteins. What we're delivering here is proteins that will then lead to a specific cut in the genome of the cells. But to be able to repair specific mutations inside a cell, people have seen in the past that it's possible to do this by inducing a specific break in the DNA at some specific position that you have predetermined. And then the cell will take care of the repair mechanisms. So, if you, at the same time provide a small piece of DNA that had some homology to that particular region in the genome, then this small piece of DNA will be used as a template for the repair. Chris:: This is rather like a puncture repair kit for a bicycle. You've got a virus particle there which brings in all of the machinery to make good the damage. It cuts open rather like identifying the hole in the inner tube and then it's even got the sticky patch inside which is the piece of genetic material you want to paste in, in order to make good the abnormality. Jacob:: Yeah, exactly. You put it in a perfect way. 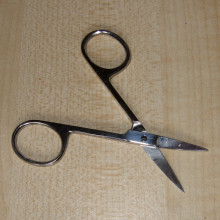 We have called it 'scissors and glue' or 'the scissors and the patch'. So that by providing these proteins that are able to make the cut in the DNA by providing those in the virus, we think we are providing the scissors for cutting in the DNA. At the same time, you can then have these viruses to deliver this little piece of DNA and then this DNA will be able to act as a patch that will make the repair. Chris:: Tell us the nuts and bolts of how this actually works though. Where are the proteins that you're carrying in inside the virus particle and how do you then package up the piece of genetic material that you want to do the repair with? Jacob:: Right. So, that's of course sort of the basics of this - how to get the protein into the virus particles. What we're doing in this case is to fuse this particular protein to the structural proteins of the virus. So, the smart thing about the virus and how the virus is actually working in nature is that it's packaging all its proteins into the virus as one big protein so to speak. It's what is called a polypeptide. So, this polypeptide is packaged into the virus and after budding of the virus from the cell, this polypeptide will be cut into smaller pieces. So, when it does that, this particular foreign protein is released. Chris:: So, that will be floating around inside the virus particle and then when it mix, goes into the cell. It will be released in the cell where it can do its job. Jacob:: That's true and when it gets into the cell, it is now ready to do its action. So, that's what we are seeing. That we actually have quite low amounts of this protein in the cell, but it's far enough to make the action. the action in this case would be to find its position in the genome, make the cut in the genome, and induce this sort of repair. Chris:: What is the evidence that this wonderful strategy does deliver? Jacob:: Yes, so we've done several things. One thing is first, to deliver the protein in the viruses. Not going for repair. Just to see whether this protein has actually able to cut inside the genome. So, we can see what we call 'gene disruption' very efficiently after the delivery of this virus. So, the next thing we did was to then include the patch for repair inside the virus particles so that we do what we call 'all in one particles' where we have both the scissors and the patch in the same virus particles. For that, we developed a system where we could screen for specific repair mechanisms. So, in this case, we used a reporter gene, the GFP gene that has a mutation. We are trying to repair this particular mutation. So, we can see when we deliver these virus particles both with the scissors and patch that we have quite significant repair of this particular GFP mutation. 26:04 - How many genes do I share with grass? 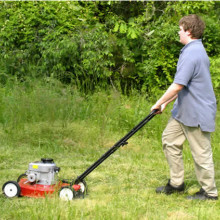 How many genes do I share with grass? Aylwyn - When we ask about shared genetic information between species, in other words, when we compared the DNA sequences or genomes of one species with another, we're really asking about the common ancestry of those species. So for example, with humans and chimpanzees, when we look at the chimpanzee genome, about 99 per cent of it matches up with some place in the human genome. And that's because chimpanzees are very close in evolutionary terms to us. The common ancestor was about 6 million years ago - a long time for us, but short time for evolution. We go a bit further back to the common ancestor of say, humans and mice, that's about 10 times longer ago. There's been a lot more time for divergence and then we find only about 75 per cent. About 75 per cent of the mouse genome can be matched up almost exactly with some area in human. When it comes to comparing humans or any animal with a plant such as grasses, we're then talking about a much, much greater gulf in time, around about 1.5 billion years. As you might expect, there's very little that remained unchanged in the genomes of either lineage since that time. Trying to make the same comparison that I just talked about, around about 25 per cent is representative thereabouts of the kind of similarity at that scale. However, we can relax the constraint somewhat. We look for similarity which is not exact, but nevertheless, close enough that there's similarity in function between regions of the genome. Then when we look at plant genes, we can find over half of them have some recognisable counterpart in humans. And that's presumably because those genes had an important role in the common ancestor and continue to do so in their descendants. Kat - Thanks to listener Martin Richards, Cambridge University's Dr Aylwyn Scally and Harriet Johnson. And finally it’s time for our gene of the month, and this time we’re venturing into the garden with a gene called Delila. Kat:: And finally it's time for our gene of the month, and this time we're venturing into the garden with a gene called Delila. Found in antirrhinum, or snapdragon, plants, Delila is responsible for the distribution of brightly-coloured chemicals called anthocyanins, which give the flower petals their brilliant hues. Molecularly speaking, the Delila gene contains the instructions that tell cells to make a transcription factor - a protein that switches other genes on or off. 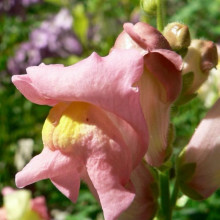 Snapdragon flowers are made up of a tube leading to open petals, and faults in the Delila gene create flowers with coloured petals but colourless white tubes - perhaps one of the prettier mutations we've covered on the Naked Genetics podcast for a while. Previous Can eating sweets stop brain fatigue? Next Why do we yawn?